Needle Exchange » Soccer Season! « New Norah Gaughan Out! The Summer Olympics are 2 months away, so I thought I would reblog the soccer ball pattern I wrote up for the Word Cup in 2006. The soccer ball pattern is here and the PDF is here! If you want a nice soft indoor ball, knit this with cotton or wool and stuff with a fabric ball or ball form. If you want an outdoor ball, you can cut strips of plastic bag or some other water-resistant yarn and knit it around a mini beach ball. You can also use a thinner yarn to make a mini ball, key ring or hacky sack. The PDF includes a bunch of ideas for patriotic colours, in case you’d like to support the home team. PS: This is cool! How coincidental. 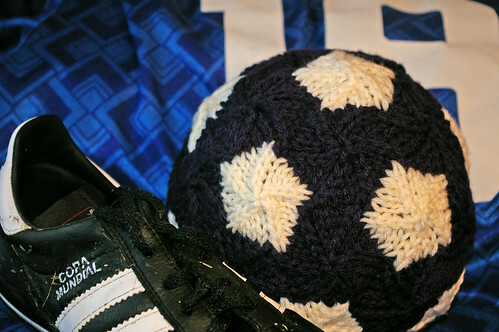 If you don’t want to knit a soccer ball (anyone watching Euro 2008? Yay!) you can Knit an Inukshuk for the 2010 Winter Games in British Columbia. This entry was posted on June 10th, 2008 at 7:38 am and is filed under Ideas & Inspiration, Patterns by Me, Soccer Ball. You can follow any responses to this entry through the RSS 2.0 feed. Both comments and pings are currently closed.